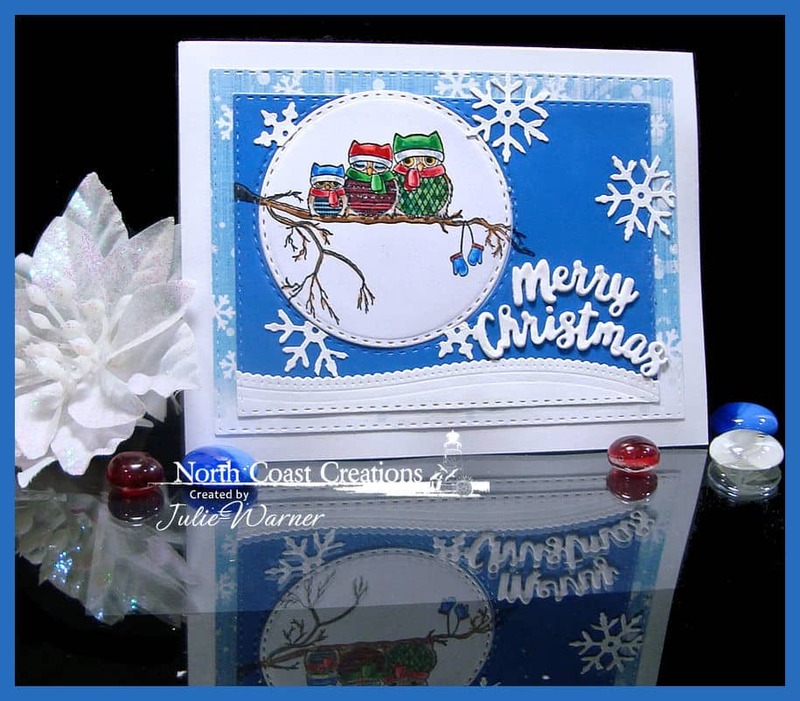 Welcome to March & to the Splitcoaststampers Fan Club March Christmas Challenge! I’m part of the challenge team again this year & the bonus is I’ll have a bunch of Christmas cards finished in plenty of time for Christmas this year. You’ll need to be Fan Club member but that’s easy…just click the blue link to find out how. Bet you’re wondering what the challenge theme is..I’d love to tell you but you’ll have to go see for yourself. 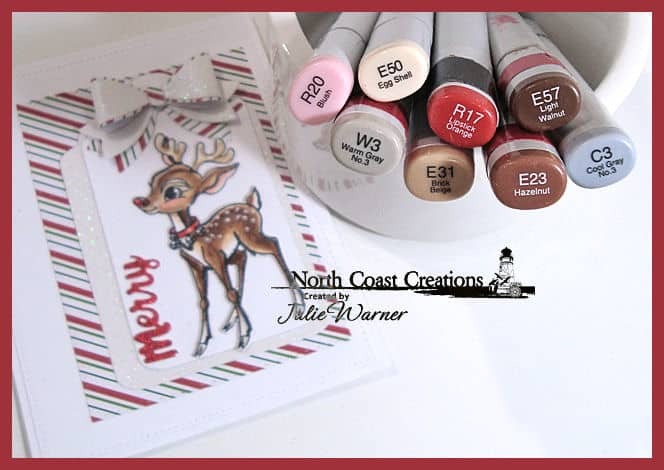 For my card, I used this cute little Reindeer image. 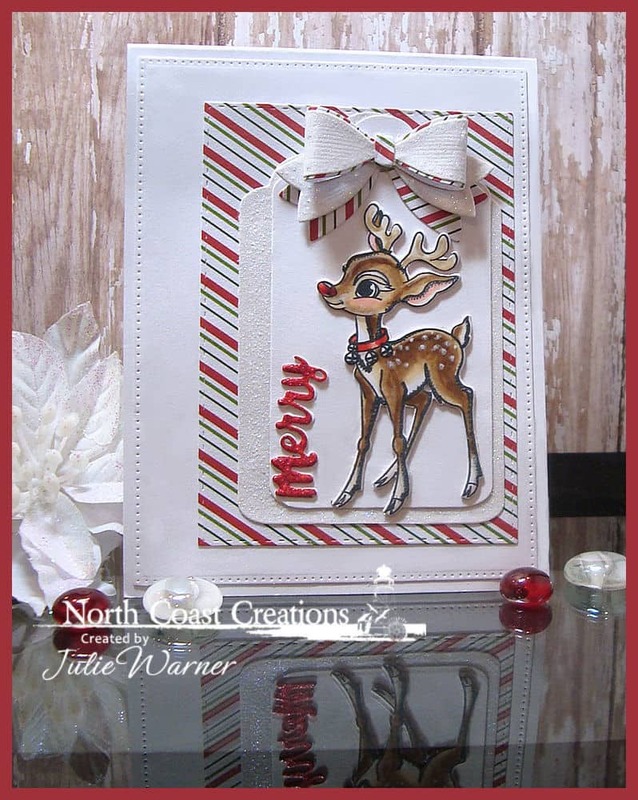 After coloring & die cutting w/ the matching die, I put him on a tag die cut. 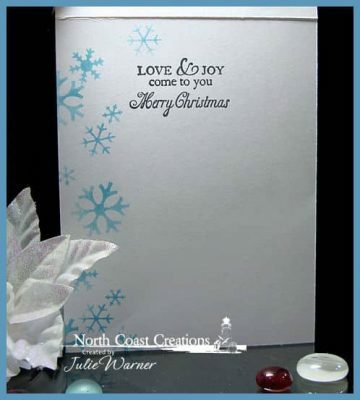 I cut another tag out of white glitter & split it down the middle to have some show on either side. 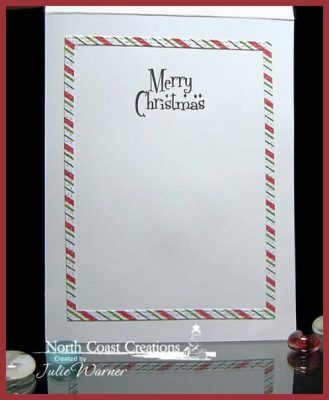 The Merry was die cut out of red glitter paper. I die cut two bows & split the striped one to edge the white glitter one. 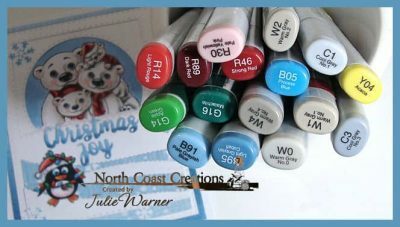 North Coast Creations Dec Release! Welcome to the North Coast Creations December Release! We have some really cute images & matching papers for you! 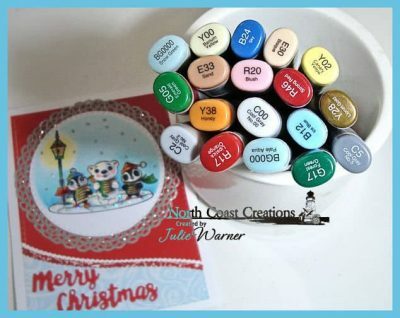 These Christmas critters are just adorable & so fun to color! 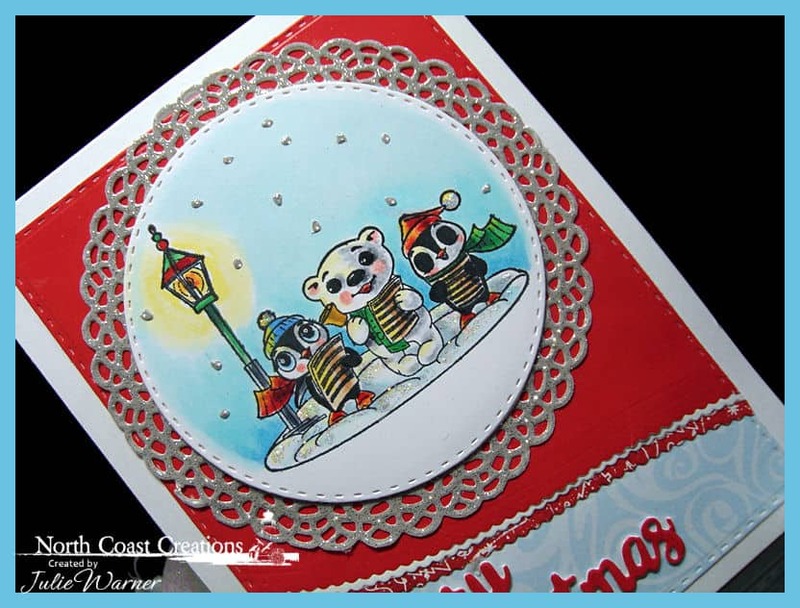 For my first card, I used this caroling trio. 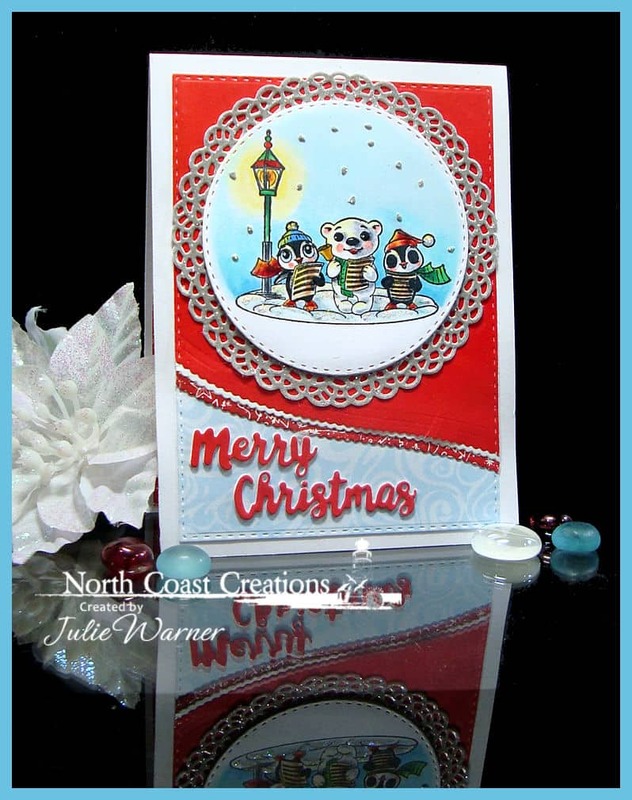 After stamping & coloring, I die cut & added a silver glitter die cut Fancy Circle behind it. 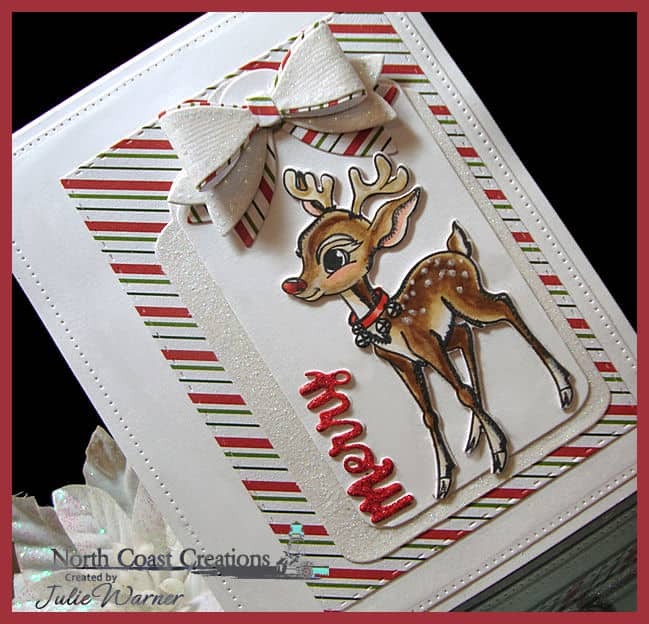 I used some of the little All the papers are from the matching Very Merry paper pad & the greeting is from a fabulous set of Holiday Words. Here’s the inside & the Copic colors I used. My second card uses another image from the set & more of the coordinating papers. 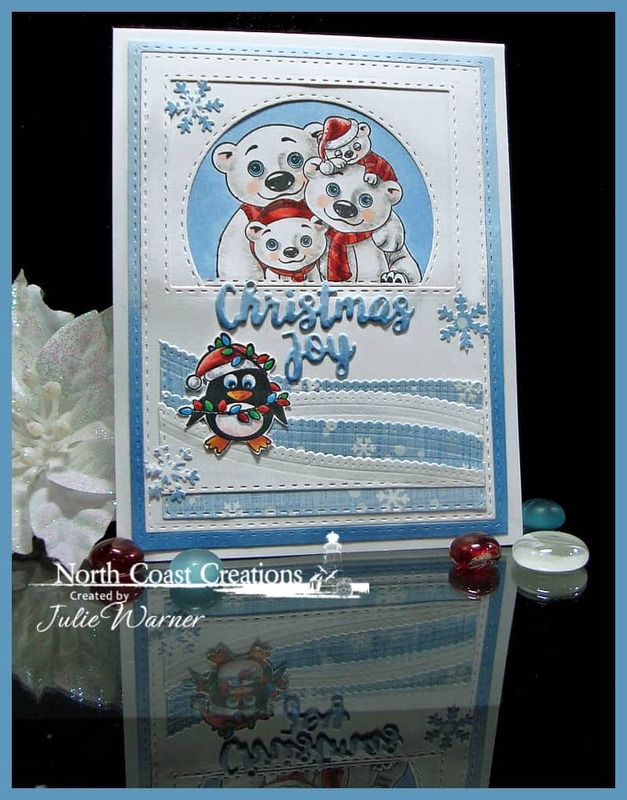 After stamping & coloring I again die cut w/ the Double Stitched Circles dies. I lined up where the circle would be & stamped the branches again on the blue layer. 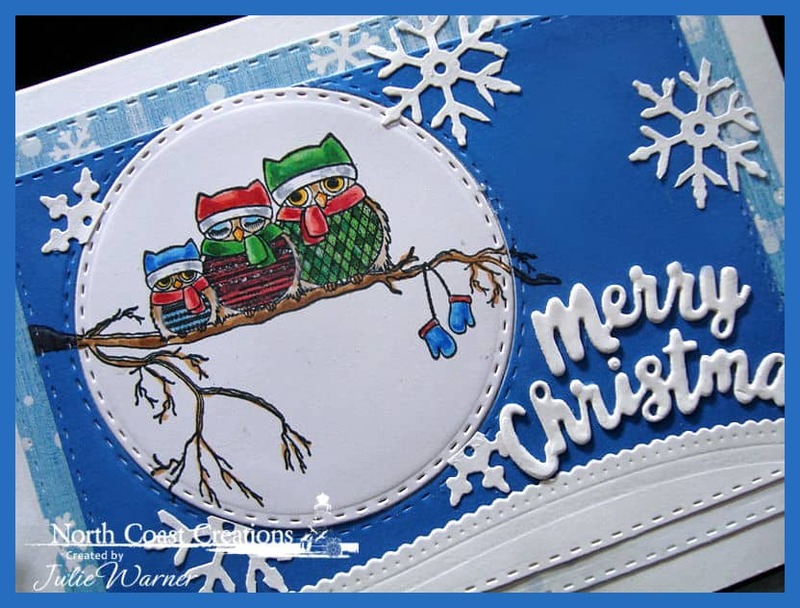 I wanted it to look like the owls were in front of a huge moon w/ the dark blue sky behind them. 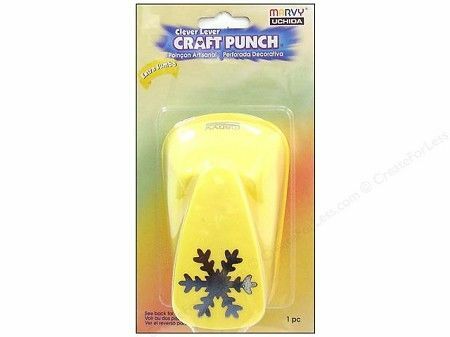 I also die cut a couple of the Elegant Emboss embellishment ornaments out of white then snipped out the snowflakes to add on the blue background. 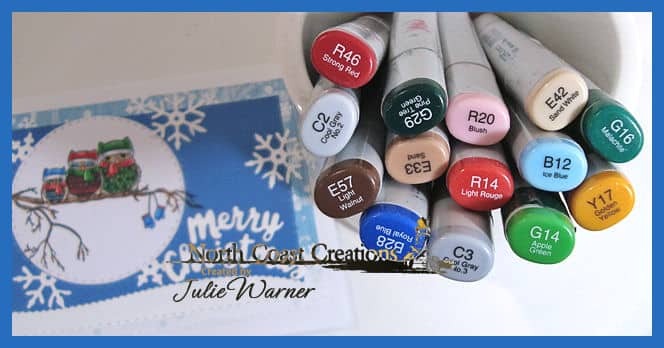 Such a wonderful inspiration site Stacy chose! I’m sure a lot of people are familiar w/ Shutterstock..they have so many fabulous photos & clip art. I was inspired by THIS picture. 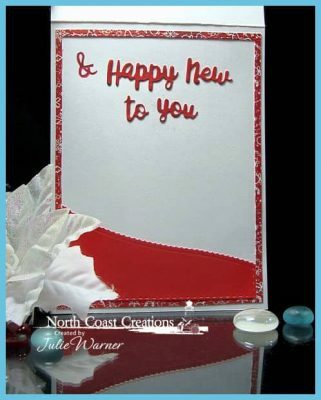 I started w/ a new set from North Coast Creations w/ cute little critters & my card just evolved into what you see. 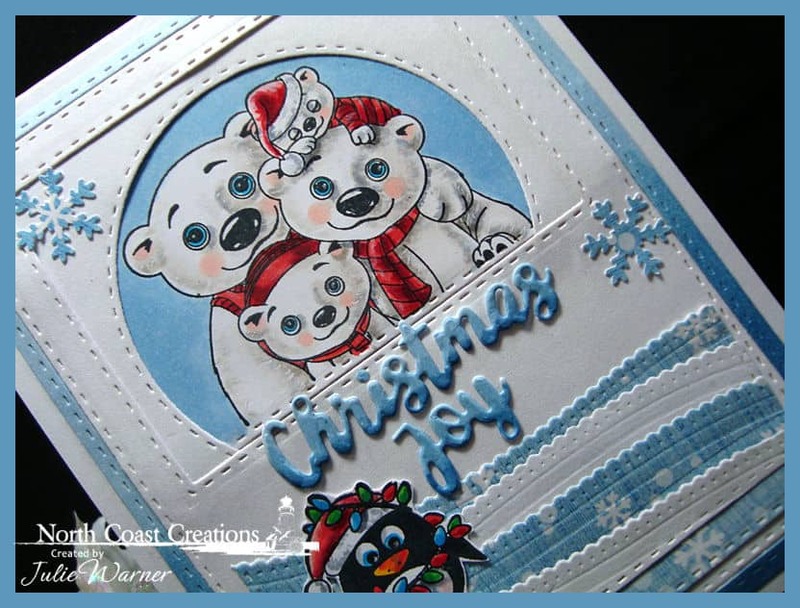 After stamping & coloring the polar bear family, I added a stitched circle frame then a stitched rectangle frame w/ a smaller stitched rectangle window on top of it. I die cut some white & snowflake paper hills, added them to the bottom & then attached my little fussy cut penguin. 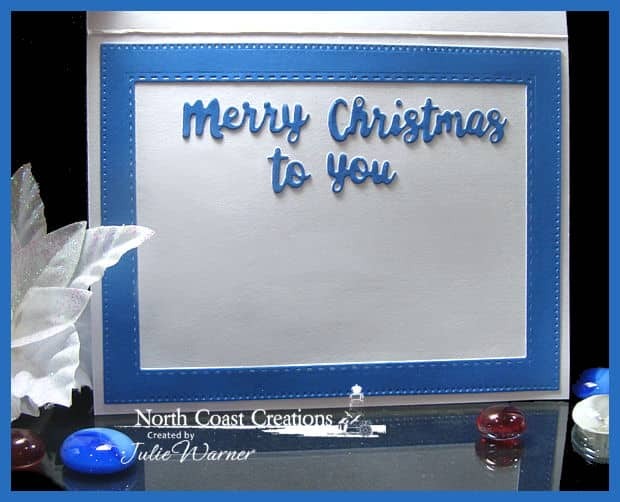 The greeting was die cut & colored w/ Copics as well as the narrow blue frame around everything.